Free domestic (US) shipping on orders of $50 or more. Our Wild Harvested Siberian Chaga (Inonotus obliquus) Powdered Extract is ecologically foraged in the Arctic forests of Siberia to ensure the strongest Chaga available. Unlike raw, unextracted Chaga, this extract is entirely digestible and ready to be used with a high degree of absolute bioavailability. With our extract, the indigestible cell walls of the mushroom are broken down to release all beneficial substances, concentrated in a ready-to-use form. Chaga contains some of the highest recorded levels of SOD (superoxide dismutase) and antioxidants known. SOD is used for its regenerative and reparative anti-aging effects and its strong immune enhancement, anti-cancer, anti-tumor, and anti-virus effects. Our Chaga is a dual-stage hydroethanol (hot water and alcohol) powdered extract, standardized to contain 30 percent polysaccharides (approximately 40:1). Each 65 gram package of our Wild Harvested Chaga Extract includes the approximate equivalent of over 4 pounds of the entire Chaga—unlocked, bio-available, and ready-to-use. This concentrated form allows both better absorption and a more potent effect. Only the double-stage hydroethanol protocol offers the most significant benefit from Chaga, since one of its most potent compounds, betulinic acid, is only extracted with this method. View our Wild Siberian Chaga quick facts PDF. Chaga (Inonotus obliquus) is a parasite fungus that mainly grows on birch trees in cold regions. It requires extreme winter freezing effects. The strongest Chaga grows in forests above the Arctic Circle. Our Chaga is harvest in ideal growing conditions, from regions affected by the harshest winters, to ensure Chaga 's highest quality and efficiency. Betulinic acid, one of the most potent compounds found in Chaga, is formed in the mushroom by extracting its precursor from the bark of birch trees and is present in larger concentrations in colder regions. Among the indigenous and traditional people of Siberia and Russia, Chaga is the most renowned medicinal plant or fungi. It has traditionally been prepared and used to enhance the immune system for its strong anti-tumor effects and to help fight infections. Anthropological reports indicate that Chaga has been used to regenerate the endocrine system, a consequence of particular interest to those interested in androgenic and endocrine/reproductive health. In traditional herbal medicine, Chaga was used primarily as a tonic to strengthen the body and to combat disease and infection. Known by the Siberians as the "Gift from God "and the "Mushroom of Immortality, "this strange tree growth has been used by humans for several centuries to support health. 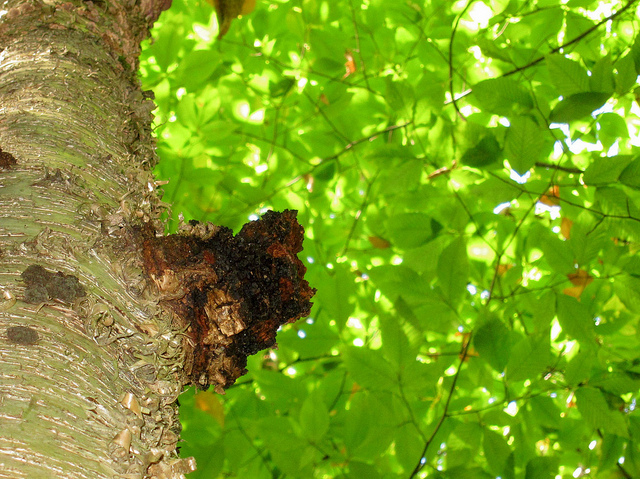 The Japanese call Chaga "The Diamond of the Forest, "while the Chinese classify Chaga as one of the "King of Plants. "It was largely unknown in modern medicine and to most people outside the cold regions until much later. Russian Nobel Prize winner Alexander Solzhenitsyn wrote two pages on Chaga 's medicinal use and value in his autobiographical novel, based on his experiences in a hospital in Tashkent. In manufacturing our Chaga Extract, we considered and researched all the available scientific and medical data related to Chaga to identify the best possible method for extraction and preparation as well as recognizing all the benefits it can provide. Across the board, we found that researches used a potent dual stage powdered extract of Chaga (Inonotus obliquus). We especially looked into the specific methods used to make the extracts. Using this information, we selected a similar dual stage, hydroethanolic extraction process for our Chaga Extract (Rhee, S.Y. 2008). This method results in an extremely potent, completely digestible Chaga Extract, where the benefits found in the mushroom have been unlocked and are highly concentrated. This method provides the extract with the highest bioavailability. This means that the beneficial substances found in Chaga can be immediately absorbed and used by the body to enhance health. Most medicinal and supplemental products made from fungus require an extensive boiling process to obtain any possible health benefit. Our Chaga extracted for your convenience and ready to use. This extract is perfect not only for saving time, but also receiving the most benefits. Our concentrated product in one dose will provide what you'd have to drink gallons of Chaga tea to gain. Each 65 gram package of our Chaga Extract requires over 4 pounds of raw Chaga, resulting in roughly a thirty (30) to forty (40) percent standardized concentration of its active compounds, in a unique highly bio-available form. Chaga Extract that is from RAW Forest Foods, the premier, and most trusted androgenic herb company. Laboratory studies on Chaga mushroom extracts have shown potential for cancer therapy, its use as an antioxidant, immunotherapy and as an essential anti-inflammatory agent. Chemical analysis indicates that Chaga mushroom contains a range of secondary metabolites, including phenolic compounds such as melanins and lanostane-type triterpenes, including a percentage of betulinic acid. It is considered to be one of the most powerful adaptogens. Chaga has enjoyed extensive scientific research into its healing and reparative qualities and is quickly gaining its rank as one of the top medicinal mushrooms known. In addition to the unique compounds found in Chaga, it also contains some of the highest levels of superoxide dismutase (SOD). SOD is a naturally occurring enzyme used in the health food community to remove wrinkles, rebuild tissue and extend the life span. In the clinical setting, SOD is used to treat pain and swelling (inflammation) caused by osteoarthritis, sports injuries, and rheumatoid arthritis. Also, SOD is used to cure the kidneys of kidney disease, to clear gout and to treat cancer. In addition to SOD, Chaga has one of the highest levels of antioxidants known (second only to clove bud essential oil), as measured by Oxygen Radical Absorption Capacity (ORAC). Oxidants are caused by metabolism in the body and are involved in many aging diseases, including cancer and cardiovascular diseases. Oxidants contribute to DNA mutations that prevent healthy, normal cell division. They also damage cell walls, blood vessel walls, and cause neuronal damage. Antioxidants neutralize oxidants, render them harmless and prevent injury. That keeps the body young. Many customers are surprised when they use our Chaga Extract that their fine lines and wrinkles begin to fade and disappear every day. The tissues are repaired, and DNA is renewed, mutation and cancer, as well as other diseases, are prevented, and the immune system is boosted. Trametenolic Acid: Is an anti-inflammatory sterol, helping combat systemic inflammations and promote the general health of the immune system. All of the compounds found in Chaga are beneficial and healthy by themselves, but in unison, they give additional effects and boost your health in multiple dimensions. Together, these compounds allow Chaga to strengthen the immune system, better-combating pathogens, including viruses and bacteria. Studies have shown its use to produce a 300% increase in natural killer (NK) cells. Natural killer cells are specialized cells of the immune system responsible for killing cancer and combating viruses. The unique compounds betulin and betulinic acids found in Chaga have been shown to be anti-tumor, prohibiting the growth of tumors. The oxygenated triterpenes in Chaga contribute to its anti-viral and anti-protozoa effects, showing actions against both the HIV retrovirus and the protozoa that cause malaria (Plasmodium). So, Chaga not only helps strengthen the immune system by itself, but it also helps it perform its function by combating viruses and other infections and pathogens by having the antiviral and antimicrobial action of its own. While Chaga contains many highly beneficial compounds, many of them occur in small amounts (approximately less than 1 percent) in whole Chaga and are inaccessible in raw or non-extracted Chaga. Mushrooms and fungi consist of a type of long-chain polysaccharide called chitin (pronounced chy-tin). The body lacks the enzymes needed to break down chitin, which is why many wild mushrooms, while not poisonous, cause severe gastrointestinal distress when consumed (store-bought mushrooms have been selected for their digestibility). The nutrients and medicinal compounds in such mushrooms cannot be absorbed unless the cell walls are broken down. This is exactly what we do here at RAW Forest Foods: provide our customers with the best possible products, concentrate the product and multiplying the effects. When consuming raw, non-extracted Chaga, all the beneficial compounds remain locked inside the Chitin. Traditionally, Chaga was broken into smaller pieces and boiled for at least six hours. While this works to release the active compounds, this processing method does nothing to concentrate the low levels of beneficial compounds that naturally occur in Chaga. It is also impractical for most people. Our extract completely breaks down the chitin in the fungus, resulting in a one hundred percent digestible, completely bio-available Chaga preparation. RAW Forest Foods ' Chaga Extract is about 40 times the concentration, bringing up to 40 percent of the 1 percent active compounds in Chaga. Additionally, the unique extraction process used in our extract completely breaks down the chitin in the fungus, resulting in a 100% digestible, fully bio-available Chaga preparation. Serving size is 2 grams, taken twice daily or as directed, preferably on an empty stomach. Once in the morning and once in the evening. In each 65 gram pouch, there are approximately 32.5 servings of Wild Siberian Chaga Extract. Standardized to a 30% polysaccharide concentration. At RAW Forest Foods, we like to take our powdered extracts in 4-6 ounces of warm water, and consumed on an empty stomach. Learn more about using all of our products here. Store this product, and all RAW Forest Foods products, in a cool, dry place, away from sunlight and moisture. Try and use in a timely manner after opening the package. For those customers who prefer to rotate their pro-androgenic and tonic herbs, we suggest a schedule of five days on and two days off, or four weeks on and one week off. Before starting any new medicinal herbs or nutritional supplements (from our company or otherwise), customers should consult with their qualified healthcare practitioner. This not because we question the safety of our products, but because we believe in the strength of our products and that plants have a medicinal, therapeutic potential. This product is not for use by those under the age of 18, who are pregnant or nursing, or who are allergic or adverse to any of the ingredients contained within. At RAW Forest Foods, we pride ourselves on offering our customers only the highest quality ingredients and products, profesionally—yet artfully—crafted for you. Our Arctic Bear Wild Siberian Chaga Extract is no exception. I've been feeling intuitive like my body has needed Chaga for quite some time now and I've always hesitated because the other brands on the market that I've considered buying just haven't felt right for some reason. I bought this for myself recently and felt so incredible even after the first cup (I have it before bed with hot tea). It just feels "right" and I look forward to how it makes me feel daily. I don't have any particular health issues that I bought it for, I've just been very drawn to it I suppose for things going on inside I may not be aware of. I was worried about the taste, but it tastes amazing and mixes into tea perfectly! Highly recommended! In my short term experience in the last month of using this product I have found it to keep my immune system strong and keep me from getting sick during extreme workload schedule. Less joint pain and allover health has improved. Will keep ordering from Raw Forest Foods. Mix this up as your morning coffee ha add it to your coffee. RAW Forest Foods is a seriously dank Chaga. Much better then the stuff I have harvested myself in northern New York State and Pennsylvania. Keep rockin' the dank chaga raw forest foods!!! I've tried using a few different chaga preparations (from several companies I won't mention), including tinctures, capsules, and other powdered extracts. None of them have had such great effects as this extract, and the price is the lowest. The quality is obvious. After taking one teaspoon daily for several weeks, I have had a huge improvement in my immune system already. This is great, because I tend to have a weak immune system. My skin is much nicer, wrinkles seem to be disappearing, perhaps due to the strong ORAC score. Lastly, I feel just a general strength to my endocrine system. More reserve energy, just stronger. I highly recommend this product, just with they would come out with a larger size!